>> India at its decades of lowest credit growth, as per data by RBI. Does the low credit growth reflect the lower credit appetite for corporate borrower? >> Non-performing assets has increased by 5 times in just 5 years. Are stressed assets at peak level or how much more are still left to be recognized? >> Transferring power from bankers to RBI- Will it lead to fast resolution of stress assets? Is India really at its decades of lowest credit growth? 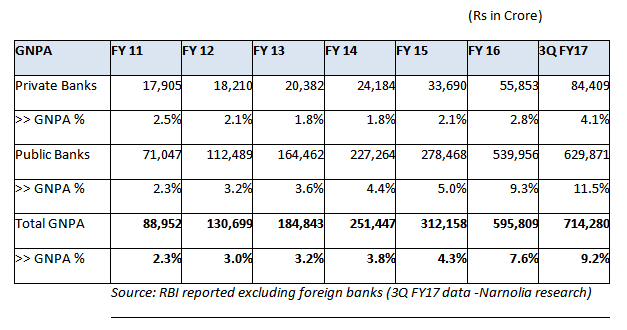 Recent data by RBI on advances for Indian Banking shows the credit growth at low of 5.1% in FY2017. However, adjusting for some facts (like- the conversion of a loan under UDAY scheme into bond, FCNR loan repayment, and demonetization impact), the adjusted credit growth is more than 9% for FY2017. Our interaction with the managements of various banks also signals a strong loan growth. We expect a large part of the credit growth to be supported by private banks and selected few public banks. In regards to assets quality, the Non-performing assets of COMMERCIAL BANKS have increased by 5 times in just 5 years. The GNPA of banks has mounted to the level of Rs 7.14 Lakh Cr in December quarter. To our understanding, banks have recognized most of the bulky stress assets during last 5 quarters. While assets quality issues continued to persist in FY2017, the pace for incremental slippages will slow down significantly for the majority of banks. The Government has recently passed an ordinance to empower the RBI to tackle the stress assets in the system. Now the RBI can issue instructions to banks to initiate the resolution under the Insolvency and Bankruptcy Code 2016. We see this ordinance as a welcome step to fasten the resolutions of stress assets as earlier to this, slow decision - making process under PSU banks was hindering the resolution of large stress assets. But the basic question remains the same that how this new ordinance will help to get bank’s money back from stressed corporate borrower? How and when oversight committee will be formed by the RBI? Is there any chance for a conflict of interest between the RBI and the management of bank? How much would the haircuts be taken? Answers to these questions are uncertain as of now and will take much time for clearance. In the meantime, we analyze that if the resolution is delayed, then ageing related NPA will badly hit the PAT in FY2018 for big corporate lenders. Also, one basic problem for PSU banks will even persist in terms of low capitalisation and any delay or huge haircuts under resolution process will again impact the capitalisation. Based on our analysis, we are positive on private banks as they will continue to acquire market share from public banks. Thus, loan growth is expected to remain healthy going forward. Continuation of investment in digitalisation has resulted in controlled and declining operating expenses hence cost to income ratio is improving. Private Banks have comparatively much lesser stress assets against public banks. Healthy capitalisation ratio will help to increase the business going forward. However, we are cautious on high valued stocks. But the decline in prices will give an opportunity. Our top picks are HDFC Bank, Federal Bank, Yes Bank and Axis Bank. Apart from these, public sector banks like Indian Bank and Vijaya Bank are our top picks based on retail business focus, adequate capital, relatively low-stress assets and higher recovery than slippages. Hence, these two stocks have more than doubled from our initiation price. But currently, both of them are trading at a higher valuation of their range hence we have recommended profit book. We are very much cautious on public bank due to high-stress assets and low pace of recovery but if some investors want a public bank in their portfolios then they can go ahead with SBI.